The Cape Town Talent Exchange has a mobile site for accessing your CTTE account using your mobile phone. 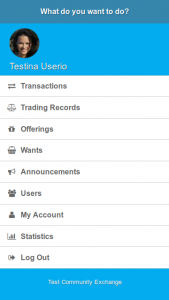 The mobile site is a cut-down version of the full CTTE site but it has all the essential functions for managing your account. If there is something you can’t do, access your full account at a later time. You can view, enter, edit and delete offerings, wants and announcements, change your account details, view the account details of others and obtain statistics about site usage. You can enter transactions with other traders, local and remote, and view their trading positions instantaneously. You will find that there is very little that you can’t do! Use the mobile site at markets to enter transactions and check the standing of other traders, or at any time when you want to get or enter information quickly.